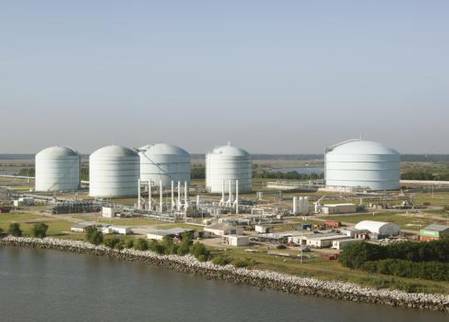 * The $122 million pipeline is designed to deliver up to 0.6 billion cubic feet per day (bcfd) to Cheniere Energy Inc's Sabine Pass liquefied natural gas (LNG) export terminal in Louisiana as Cheniere adds a fifth liquefaction train at the facility. * Cheniere said Sabine Pass 5 is undergoing commissioning and is expected to enter commercial service in the first quarter of 2019. As part of the commissioning process, the facility is expected to produce LNG. * There are already four liquefaction trains operating at Sabine Pass, the first big LNG export facility to enter service in the Lower 48 U.S. states in February 2016. Each train is capable of liquefying about 0.7 bcfd. * The U.S. Federal Energy Regulatory Commission (FERC) approved Kinder Morgan's request to build the pipeline in November 2017. FERC approved the company's request to put the project into service in August 2018.